'Greece' evokes two pictures in most people's imagination: the ancient cradle of Western civilization, democracy, philosophy, literature and drama, marathons, the Olympics, and some of your favorite math principles. You also picture one of the most alluring modern travel destinations. Greece's mountainous mainland and hundreds of islands surrounded by the Aegean, Ionian, Cretan and Mediterranean Seas are among the top Mediterranean vacation locales. 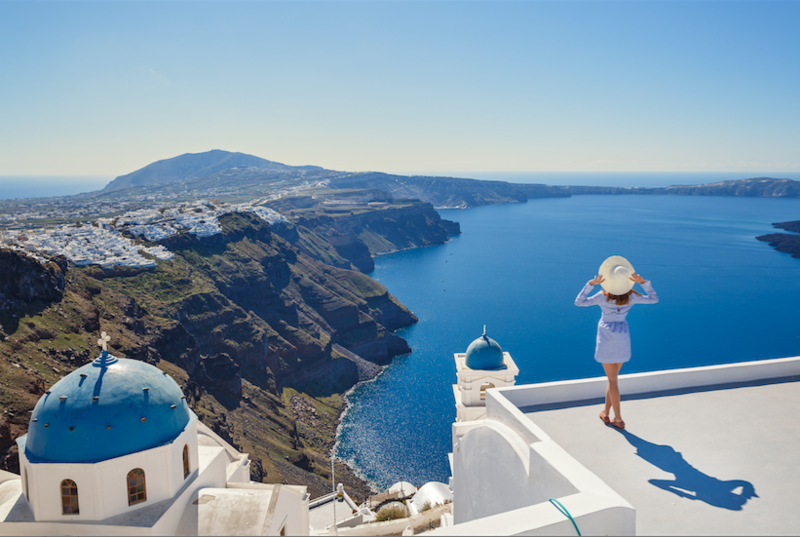 Over two hundred of the islands are inhabited, many of them rich in history, mythology, and the Mediterranean culture, cuisine, a maritime and beach lifestyle that's cemented Greece on so many travel lists. Some travelers in the know take holidays to Greece year after year, and Greek islands are a highlight of Eastern Mediterranean cruises. If you've never visited Greece, here are just a few of the islands to begin your exploration and your 'collection'. When you hear 'Greek island', chances are that the sight that pops into your head is one of the iconic pictures of Santorini. The island's sky blue domed church roofs, white washed buildings on the edges of cliffs, and steep, narrow cobbled streets overlooking brilliant blue seas stand in to represent the iconic Greek island vista of everyone's travel dreams. Santorini is what remains of an island after the eruption of an ancient volcano. Now, a giant lagoon is encircled by 300 m (980 ft) high steep cliffs of a crescent shaped island and a much smaller island opposite where the remaining volcano rim is still above the sea. Visiting ships, yachts and local fishing boats approaching the shelter of the curve are afloat in the crater of the volcano. Inside the caldera, the water is so deep - over 400m - that only the largest ships can anchor. Santorini's capital, Fira (Thira) clings to the top of the cliff over the lagoon. Don't Miss: volcanic-sand beaches in unique black or red sands, brilliant sunsets, a traditional and a growing modern food culture. Santorini's micro-climate nurtures tomatoes and capers of famously exquisite flavor, and an indigenous grape varietal that local vintners turn into celebrated crisp, dry white and amber-toned wines. Mykonos is the Greek island where Ibiza party and French Riviera beach lifestyles meet. 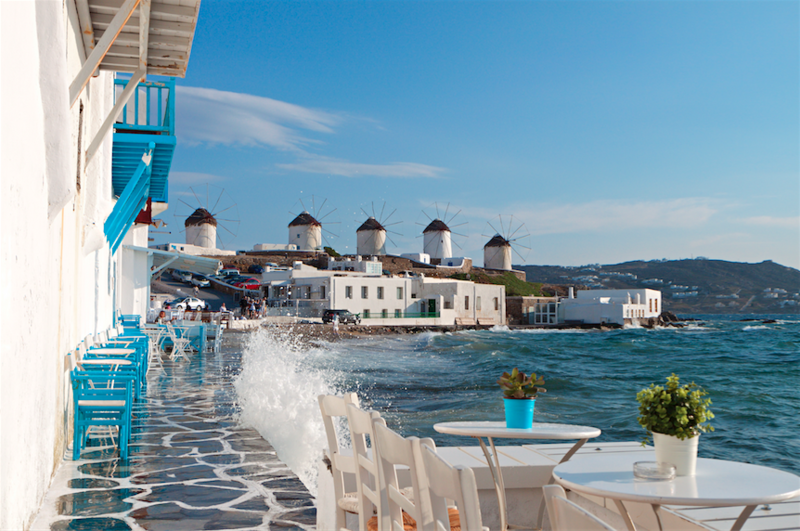 Cosmopolitan, glamorous, Mykonos may be Greece's most fashionable holiday destination. Luxury hotels, stylish bars, clubs and parties where beautiful people come to see and be seen until dawn, and sleep it off on magnificent beaches or private yachts… if that is your style of travel, Mykonos is for you. It's also known for being an LGBT-friendly destination and party central. Mykonos is both the island and its main town, which is also called Chora (meaning 'town', in the Greek style of towns with the same name as their islands). Picturesque local architecture, sunsets, people watching and shopping appeal to younger and more mature visitors. The island's nickname is 'the Island of Winds'. Windmills are one of the defining and unique features of the Mykonos landscape, built by Venetians in the 16th century to grind flour and used until electricity took over only a few decades ago. Don't Miss: Romantic, artistic Little Venice, where rows of 18th century colorful fishing houses with overhanging balconies line the seaside, many of them shops, cafes, and galleries. Rhodes' nickname is The Island of the Knights. Its Old Town is a UNESCO World Heritage Site, one of the best-preserved mediaeval towns in the world. Walking its Street of Knights, you feel transported back to the Middle Ages, when conquering Crusaders built fortifications, Palace of the Grand Masters, towers, inns and rest of the city and streets that remain today. 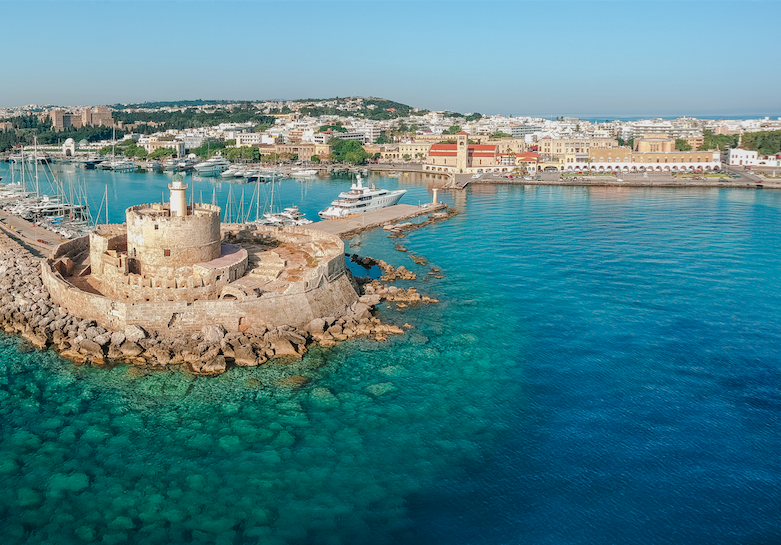 But Rhodes' history pre-dates mediaeval knights by thousands of years, when the island's strategic position made it central to ancient history. One of Rhodes' lasting claims to fame is a landmark that no longer exists. The Colossus of Rhodes was one of the Seven Wonders of the Ancient World. Erected in 280 B.C. at the Mandraki harbor to mark a battle victory, the Colossus was a bronze statue the unbelievable size of the modern Statue of Liberty. It stood for less than a century before an earthquake toppled it. The Colossus' remains lying on the ground drew travelers who came to awe at its size for another 800 years. Today the statues of deer on pillars mark where the Colossus' feet were said to straddle the harbor and allow ships to pass beneath. In most of the Greek islands, the sun shines 300 magical days a year. Summers are high season for travelers arriving by air, yacht, and cruise ship, but April- June and September- October are blessed with lovely weather. Looking for mild weather, quiet exploration – and a bargain? More and more people are discovering Greece in early and late winter months too.